All applications together with detailed resumes, copies of qualifications and references should be sent by 20th April, 2019. Subrails Group is one of Fiji’s well-established business houses. Our leadership in activities ranging from manufacturing, wholesaling and retailing, touches the lives of Fiji’s people in many ways. 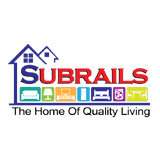 Subrails Furniture was established by the sole proprietor Mr. Subrail Gounder in 1988. From humble beginnings the company has grown in size over the last 29 years to become one of Fiji’s largest furniture manufacturer, wholesaler & retailer, employing over 250 individuals Fiji wide. Over the years, Subrails Group has ventured into natural extensions of its business with the establishment of its timber sawmill, export factory, chain of furniture & electrical retail stores across the country, acquiring of a foam plant and upholstery business. The group head office & manufacturing plant is located on a 44.5-acre site on Kings Road, Vitogo, Lautoka, Fiji Islands.